Instant Besan Dhokla Recipe is a traditional dish of GUJARAT. 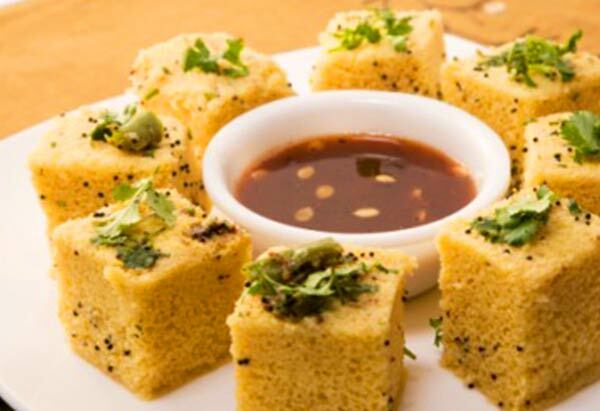 Dhokla is a vegetarian snack item and it is prepared from chickpea flour(also known as besan) or rice. There are different types of dhoklas with different ingredients like Rava Dhokla, Khatta Dhokla, Rice and Chana dal Dhokla, Khaman Dhokla, Safed Dhokla, Khandhavi Dhokla, Idli Dhokla, Sandwich Dhokla and many more. Hence, different methods of preparing them. Here we will learn how to cook Instant Besan Dhokla with a very simple and quick method. Take Gram flour(Besan) and add grated ginger, finely chopped green chilli, turmeric powder, salt, sugar, oil and yogurt and water . Mix until a smooth batter forms. Take a microwavable container , grease it with oil and pour batter in it. Put the container in microwave for 4-5 minutes at full power. Bring the container out. Let the dhokla cool. SEASONING : Take a pan and add 2 tsp oil , mustard seeds , green chili , curry leaves , lemon juice , sugar, 1 cup of water, curry leaves, lemon juice and sugar to the pan. Now slice the dhokla and pour the hot seasoning on the dhokla. Garnish it with coriander leaves and green chillies. Serve hot. Step 2 : Take a microwavable container and grease it with oil. Now pour batter in the container and put the container in microwave for 4-5 minutes at full power. After 4-5 minutes bring the container out. Keep it aside and let the dhokla cool. Step 3 : Take a pan over the medium flame and add 2 tsp oil to the pan and heat it. Add mustard seeds , green chili and let them sizzle. Add curry leaves, lemon juice and 3 tsp sugar to the pan . At last add 1 cup of water to the pan. Bring it to a boil. Now slice the dhokla and pour the hot seasoning on tha dhokla . Garnish it with coriander leaves and green chillies serve hot. You can poke a tooth pick at the center to check if it’s done. If the toothpick comes out clean with no batter stuck to it that means our dhokla is ready. Too thick or thin batter can affect the sponginess of dhokla.